Why would you want to use other tax saving investments, when you can invest in mutual fund ELSS? Mutual Fund ELSS is among the most potent tax saving options available with the salaried class in India, at the moment. There are several reasons for which Mutual Fund ELSS may be considered a niche product on offer for the tax-payer angling to save their precious moolah. 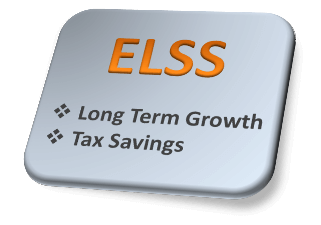 The advantages that Mutual Fund ELSS offers, gives it a clear edge over other tax savings options and makes it a potentially strong tax planning instrument in the hands of the taxpaying employee. In order to understand Mutual Fund ELSS in a more succinct manner, a few basic things about this favored tax-saving option are presented in a FAQ format. What is Mutual Fund ELSS? The Income Tax Act permits exemption up to Rs. 1 lakh under Section 80C to salaried employees every year. In order to avail of this exemption, taxpayers have to invest in certain designated schemes specified. Mutual Fund ELSS or Equity-linked Saving Scheme is one such option which offer tax saving benefits to the tax payer by investing the money in select equities. How does Mutual Fund ELSS compare with other tax savings schemes? The bouquet of tax savings schemes on offer are made up of a number of items like Life Insurance Policies, National Savings Certificates (NSC) and Public Provident Fund (PPF) investment schemes, to name a few. While these options may be solid safe investment bets, the lock-in period and the return that they offers may not be very attractive for all classes of tax-saver-investors. What makes Mutual Fund ELSS a better option? For the purpose of saving tax, employees may opt for such schemes as National Savings Certificates, and Public Provident Fund however these schemes have a fairly long lock-in period. In fact it is 5 years for NSCs’ and 15 years for PPFs’. In comparison Mutual Fund ELSS have a lock-in of three years making it a relatively more liquid tax-saving option. Besides this, the returns or dividend incomes are tax free for the ELSS schemes whereas NSC income is taxable. The sale proceeds from the Mutual Fund ELSS schemes are also exempt from long-term capital-gains tax when sold after the mandatory lock-in period. What other advantages are available for Mutual Fund ELSS investments? If an investor regularly invests in ELSS schemes and for some reason is short of funds in a particular year, he can still invest by selling off his old ELSS investments which have crossed the lock-in period. The maximum amount of exemption of Rs.1 lakh as allowed by Income-Tax Act can be fully utilized by investing solely in Mutual Fund ELSS schemes. The investor may however choose to invest in a diversified portfolio of PPF, Insurance policies and NSCs’ for tax-saving purpose as per his preference. Does Mutual Fund ELSS guarantee assured returns? Mutual Funds per se do not guarantee assured returns as the performance of a fund is dependent on the dynamics of the financial market. In fact past performance of a fund is also not a guarantee for future returns. The average return from mutual fund ELSS in the last one year is more than 12%. What is the best way to invest in Mutual Fund ELSS? The investor can either invest the total funds at one go or can opt for making monthly investments through SIPs (Systematic Investment Plans) . What are the differences between Mutual Fund ELSS and other mutual funds? Mutual Funds other than ELSS are usually open-ended, meaning one can invest at any time and exit at will. However for ELSS mutual funds there is a lock-in period of three years. This period of lock-in can however provide an impetus to fund managers by offering them the liberty to invest for a period up to three years without having to think about returning the money before that. The answers to the above questions could have made it very clear why Mutual Fund ELSS is an outstanding tax saving investment among the overall tax saving schemes.